Big moolah, but worth every penny. 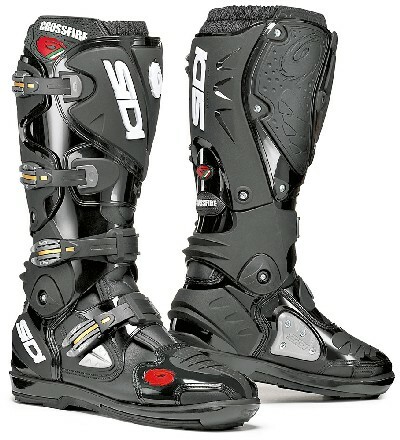 SIDI Crossfire SRS boots have only one feature that takes some getting used to - the $525.00 MSRP. After that everything else is butter. Crossfire SRS boots are the most comfortable dirt bike footwear since Steve McQueen's M-42 Type IIIs - but way more protective. All it takes to sell a pair is a trip to the nearest SIDI dealer for a test drive. Just be sure to bring your checkbook. We have some minor nits to pick with our Crossfires and we'll dispense with them right away. SRS Crossfire boots require some attention to get into properly (not our best thing). The sizes run large, one of our buckles pops open every once in a while during the course of a full day of riding (OK - once anyway) and the inner hinges have an affinity for getting hung up on aggressive foot pegs when you are trying to put your foot down. 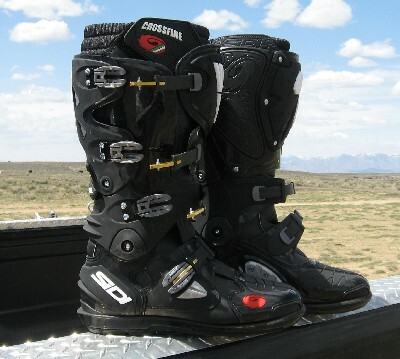 Other than that Crossfire SRS boots are the shazz: they are lightweight, they afford stellar protection, are very comfortable while riding and we do believe that you could walk a long way back to your rig in a pair of these if you had to. "SRS" stands for "Sole Replacement System" and it is indeed possible to replace the soles of these boots with a screwdriver and 1/4 turn screws (in our experience this takes about 15 minutes*). Not only are the soles replaceable, but all other high wear parts as well - all with simple tools. The Crossfire SRS stock soles are noticeably quite stiff and may require some getting used to - but all it takes is a few hours to get completely into the new groove. Once you get used to the combination of the support supplied by the beefy Crossfire soles (virtually any way that you position your feet on your pegs) with the comfort and fit supplied by the rest of the boot, there is no going back. A key feature of the SIDI Crossfires, beyond their replaceable soles, is the Dual Flex upper. Crossfire uppers permit easy boot flexing forward and backward but the boots are stiffer and supportive side to side - thus allowing for both great comfort and great protection. The Dual Flex uppers are stitch-free and constructed from very pliable (yet sturdy) injection-molded plastic. The combination of the Dual Flex ankle and independent four strap closure system allows one to dial in a very custom fit - even with knee braces or large knee/shin guards. As if this this amount of adjustability were not enough, the adjustable calf system on the boot upper is the pièce de résistance for those with outsized soleus and gastrocnemius muscles. The SIDI cam-lock buckles are made of stout metal and easy to manipulate. The precise adjustments afforded by the locking straps are really nice (the straps on the lower two buckles should be set so that closure begins when the buckles are in the 9 o'clock position). Once the strap lengths are dialed in they seem to stay in place without any further adjustment required. Toes on the Crossfire SRS boots are covered with an extra layer of plastic for greater longevity when parting sagebrush and rocks with your feet. Shift and brake lever guards are located strategically on each boot along with a large heat guard on each inside upper. There's even a nifty plastic deflector located just in front of the first buckle. There's no steel shank on the inside of the Crossfires but there is a very comfy composite insole that's removable. Rather than having a separate and removable inner boot, à la Alpinestars Tech 10's, the Crossfires, under the plastic shell, are constructed of Lorica® with a soft Cambrelle inner lining. The "inners" fasten with two Velcro® closures and are easy to get in and out of. The boots breathe very well and are cool (even in black) on warm days. The entire package is mondo plush. Replacement soles, screws, buckles, straps and deflectors for the Crossfire SRS are readily available - SIDI even sells an entire kit of spare parts for the rider who just has to have everything. New for 2012 are several types of replacement soles including a lugged enduro set that is terrific for dual sport and trail riding (we like ours a lot). MoJazz staffers have logged thousands of hours in SIDI Crossfires over the past four years.Our Crossfires have seen trail rides, desert races and MX races. They've endured sand, mud, snow, water, extremes of heat and cold and everything between. They've survived crashes that put us in the hospital (twice) without as much as a damaged buckle. SIDI customer service is great when ordering spare parts or asking for fitment advice. We have no plans for replacing our Crossfires with anything else anytime soon. They are simply the best offroad boot we've ever used. 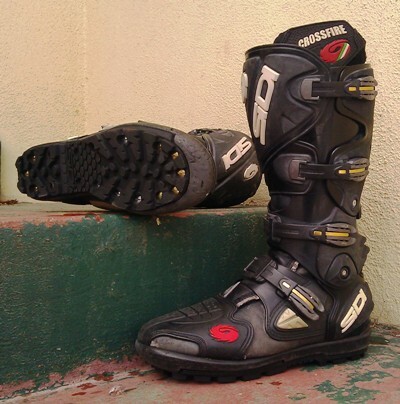 Four years ago when we first reviewed our first pair of Crossfires we wrote "We like our SIDI Crossfire SRS boots a lot and if the first few rides are any indication we believe that it's the start of a beautiful friendship." You know what? We were right. The Good: Built like an anvil, yet mondo plush. The Rad: Enough spare parts available to make you dizzy. * The simplest way of getting old soles off, after the screw heads are hammered, is to use a flat blade screwdriver to pry them off. After you pry the soles over the first few screw heads you can generally remove them by hand. 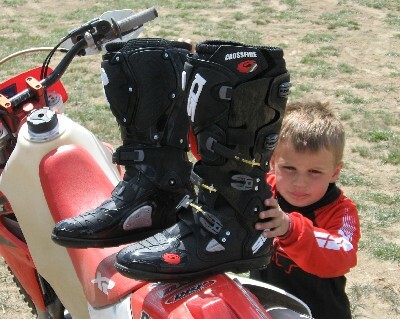 Get your SIDI Crossfire's, accessories and other SIDI boots right now at Competition Accessories. 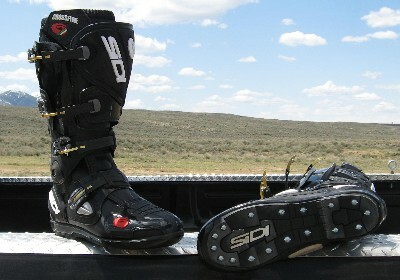 SIDI also makes an excellent Coolmax MX high sock.